Every four years the countries of the world come together in the competitive sport of soccer, known outside of the United States as "football" or "futbol." The Fédération Internationale de Football Association's (FIFA) 20th World Cup series is held in Brazil this year, and started June 12. 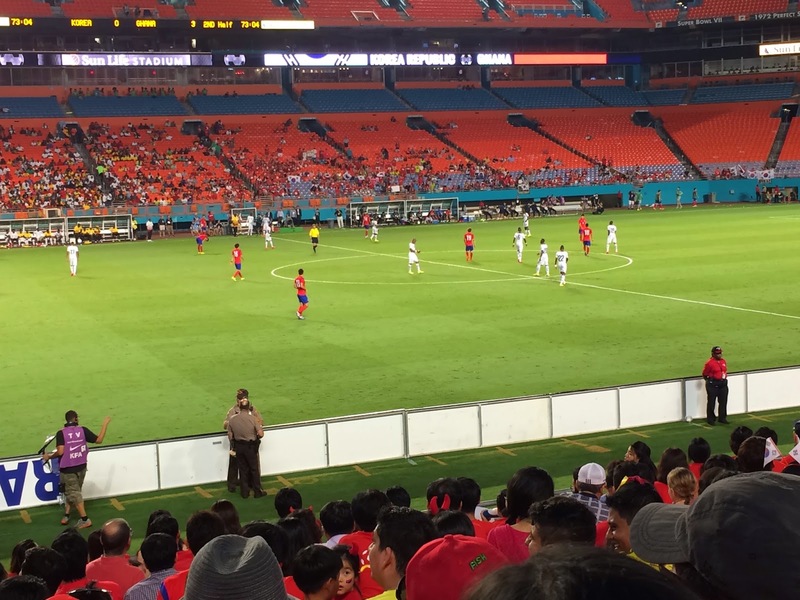 In the week preceding the start of the World Cup, several teams played pregames in Miami, Florida. This was convenient for my family because we were vacationing that same week in Fort Lauderdale, Florida, about 20 miles from Miami. We decided to attend the game featuring Korea vs. Ghana. Although I have watched soccer on television, this was my first live game. In the continuum of competitive team sports, I think basketball is the fastest pace and highest scoring. On the other end of the continuum is baseball which has a slow pace and is typically low scoring. Soccer falls in the middle. While it is extremely fast paced, many games end with scores of 0:1 or 1:2. Unfortunately for the Korean team, the final score was little more lopsided. The team from Ghana focused more on offense, and as a result, spent more time closer to their goal. More time spent at the goal increases the likelihood of a score, and the Ghana team made four goals while Korea did not make any. The final score: Ghana, 4 - Korea, 0. All of this got me thinking about goals in life. Are you making offensive plays that continually move you closer to your goals, or are you far from where you need to be? When I was in college, there was a fellow student from Nepal. For me, at the time, that seemed like the most remote place on earth and about as far from Chattanooga, Tennessee, as one could get. The primary land feature in Nepal is Mt. Everest. Let's say that I wanted to climb Mt. Everest. From a practical standpoint that will never happen because I don't have $100,000 to pay for the opportunity to climb. If climbing Mt. Everest is my goal, what am I doing to work towards that? What kinds I activities should I be involved in? A lot of physical stamina training, losing weight, and building muscle for, what many climbers have described, the most intensive physical effort. It's likely that sitting in the relaxed setting of Starbucks writing a blog post will not advance that goal. Well, I actually don't have the goal of climbing Mt. Everest. But I do have a goal of publishing a book, and writing a blog is moving in that direction. For several years I lived in Nashville, Tennessee. Nashville, known world-wide as the home of country music, draws people from all over the United States who aspire to a successful singing or songwriting career. Nashville actually has a much more diverse music scene than just country music. People come to Nashville to live their dreams, and while most don't make it the level they imagine, they put forth an effort while working as servers in restaurants. Recently, I relocated to Hot Springs, Arkansas. Hot Springs is a resort town with a variety of attractions including actual hot springs (the oldest US National Park), several lakes, and a horse racing track established in 1904. There's something for everyone. However, when I describe Hot Springs compared to Nashville, there's one big difference. No one comes to Hot Springs to live out their dreams as they do in Nashville. If you want to achieve your goals, you need to position yourself mentally and possibly physically to be closer to what defines success. Sometimes this will mean making significant, life-changing decisions. Sometimes it will mean foregoing a few small extravagances in order to save up for the vacation of a life time. Wherever you need to be, start thinking - and doing - now to get there.